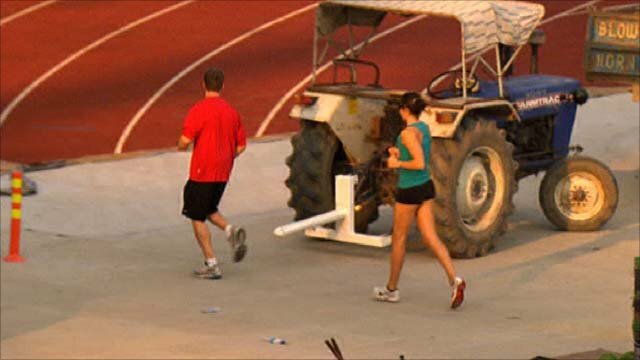 Late repairs are being made at the main Commonwealth Games stadium in Delhi as workers try to get it ready for the athletics which starts on Wednesday. Work went on overnight to resurface the damaged track, while grass was being laid on bare parts of the in-field. BBC Sport's Jonathan Edwards said on Tuesday: "This is a culture where things are got ready at the last minute but there are very real concerns. "I've seen a number of athletes come in and I think they're in shock." On Wednesday, Games officials said track repair work should be completed by 1400 local time (0930 BST), ahead of the athletics action which is scheduled to start three-and-a-half hours later. "Superficially it looks completed," reported BBC Radio 5 live's Rahul Tandon from the Jawaharlal Nehru Stadium. "They have worked all through night, although there is still some cosmetic work being carried out." The Delhi Games, which started with a spectacular opening ceremony on Sunday, has been blighted by concerns that venues and accommodation would not be completed, as well as a collapsed bridge near the Jawaharlal Nehru Stadium. A number of countries delayed the arrival of their competitors with the athletes' village being described as "inhospitable" just last week. Despite the concerns, all the competitions have so far started as scheduled, but the latest news concerning Delhi's main stadium is a huge blow to the organisers and will certainly not help the mood of the athletes. Athletics action is due to kick off on Wednesday at 1300 BST and Edwards, part of the BBC Sport team covering the event, was inside the stadium on Tuesday to witness the track being resurfaced and being painted at the 1500m start. The former Olympic triple jump champion told BBC Sport's athletics reporter Phil Jones: "There is a feeling that there are a lot of people working here but no real sense of urgency. They're relaying part of the track which I think was damaged during the opening ceremony. "For a top athlete coming into a stadium this is not what you expect. It's beyond anything I imagined. Hopefully it will be ready to go on Wednesday for the first session." The Games has suffered a number of organisational difficulties, including complaints about filthy conditions, infrastructure problems and even a snake being found both in a competitor's room and at the tennis stadium. As well as the collapsed bridge, the ceiling at the weightlifting arena also suffered structural damage. However, six days before the opening ceremony the organising committee declared accommodation fit for habitation and many of the competitors were then satisfied to move into the village. Dean Macey, in Delhi for commentary duties with BBC Radio 5 live, also witnessed the urgent repairs inside the stadium built in 1982 for the Asian Games. "There is still an awful lot to be done," the 2006 Commonwealth Games decathlon champion said. "There are tractors all over the place. "It's a little bit of a worrying situation but that's the way the Indians do it. There is a lot to be done but it wouldn't surprise me if they pulled it off."